Ultimate Ears' Boom is the best all around portable Bluetooth speaker you can buy. With the new Megaboom speaker, UE takes that superb design and makes it bigger, tougher, and perhaps, even better. The UE Megaboom looks exactly like a much lager version of the original Boom speaker. Here's an image that'll give you a sense for its size. It features a similar 360-degree sound design to the older model, except it's obviously much louder. Using the companion app for iOS and Android, you can pair the speaker with another Megaboom, or regular little Boom, for either a dual mono setup or a stereo configuration. The first setup might be useful for keeping one on in your living room and your kitchen. The other for a more traditional stereo in your living room. The Megaboom is tougher than the Boom: It's now rated IPX7, which means it's not just rugged, but also waterproof, so it can survive under one meter of water for 30 minutes. It has a 20-hour rechargeable battery, which importantly, charges using a standard USB cable, even straight out of a computer. That's important because too often I find that nice portable speakers lose some of their utility with proprietary chargers that aren't exactly ubiquitous. And though we're technically talking about a larger speaker, the Megaboom weighs a very reasonable 1.9 pounds. 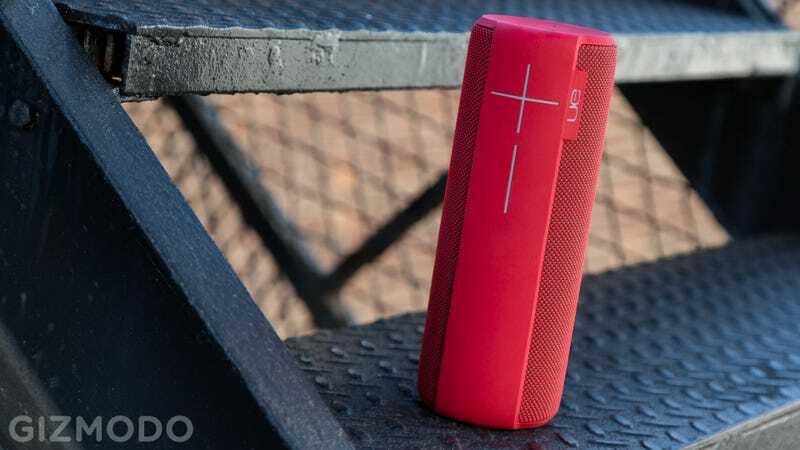 As for price, generally I think $300 is a little steep for a Bluetooth speaker but Ultimate Ears has really crammed a lot of value and good design into the Megaboom for that price, which might just make it worthwhile.